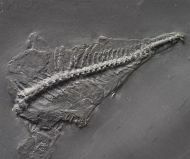 We offer in this section a small selection of fossils from Bundenbach . 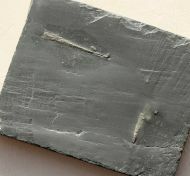 The slate from Bundenbach and its fossils are legendary for there exquisite fossils that are sometimes preserved in soft tissue preservation. 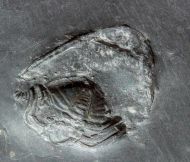 One of the most popular fossils from Bundenbach are for example trilobites with legs. Bundenbach is one of the most important conservative lagertatte in the world. Here is a fine "Bundenbach Criniod" of the species Bactrocrinites jaeckeli with a quite long stem. The Bactrocrinites itself is about 93 mm long. 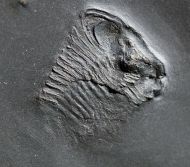 Here is a inexpensive example of a "Bundenach Trilobite" of the genus Chotecops. This is a rolled Bundenbach Trilobite of the genus Chotecops. 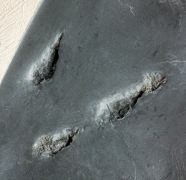 The Trilobit got prepared from both sides, the Chotecops istelft mesures about 29 x 28 mm. Here is a detailed example of a Bundenbach Starfish of the species Euzonosoma tischbeinianum. 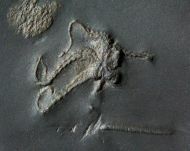 The brittle star fossil shows a umbrella like posing and offers some nice and delicate details. Here is a isolated arm of the "Bundenbach Strarfish" Loriolaster mirabilis in a nice preservation. 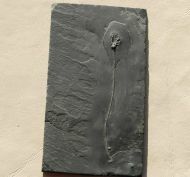 Here is a fantastic Bundenbach fossil plate with two large Starfish fossils of the species Loriolaster mirabilis and Euzonosoma tischbeinianum. 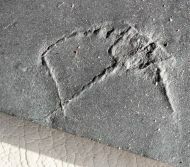 This Devonian Bundenbach fossil plate shows three snails fossils that likely belong to the genus Loxonema. Here is a good and inexpensive example of a relative rare "Bundenbach Starfish" of the species Ophiurina lymani. Here is a "Bundenbach Plate" with two specimens of Orthoceras . 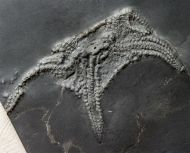 This is a fossil brittle star of the species Taeniaster beneckei from Bundenbach.